God of War is nothing short of a masterpiece when it comes to video games. Everything in this game leaves a huge impression on me, this includes, game play, writing, graphics, story, character progression and everything else on the table. Kratos makes his return on the ps4 this time; we have not seen him since God of War ascension back in 2013. 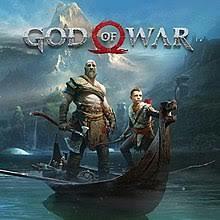 Set in the Norse mythology instead of Greek mythology, with the past catching up to Kratos just as his wife has passed away and his son still at a young age. He decides it is time for his son to learn how to survive in his brutal world. Filled with monsters, giants, ogres and trolls, while Kratos is stern with his son he is also sensitive to him as well almost giving him a human side to him instead of making him the one-dimensional character we have seen over the past decade. The way these two characters interact with each other is incredible the only thing I can compare it to is The Last of Us. Kratos acts like a tough father but when it comes to certain things in the story, you can see the emotion in his eyes and hear it in his voice, which is something we rarely see in the world of video games especially in God of War games. With Atreus, he has the accurate traits of a child his age asking questions about the world, questioning the love of his father and a bit of attitude when it comes to certain subjects in the story. These are the human traits, that we want to see more often in video games. The combat does a 180-degree turn when you compare the combat systems of the older games to the new one. In the new game, you are carrying an axe that just destroys anything its blade touches. As you progress through the game, you will get experience points so that you can unlock new moves with the axe, and as you level up you need to collect certain resources either in chests or off dead enemies, to upgrade your weapon to the next level. Progressing through the game, you run in to a blacksmith named Brok and his brother who can help you make things, like chest & wrist armor for you and Atreus but once again, to upgrade them you have to have certain resources and enough silver. The world in God of War is open but it is not open at the same time. I know what you are thinking how does this work? you can be in a area that is quite open and has many different paths, but it all leads to somewhere whether it be a chest, a mini boss fight to get an element for a piece of gear, or upgrade it, it all leads somewhere. Everything that happens in God of War left me wanting more of the series, some moments left me speechless, sad, and angry and in some cases even happy. I have only played one game like this in my entire life, The Last of Us and God of War is no exception of how spectacular it is. This so far is my game of the year so far. Good job Sony Santa Monica and Playstation.